The current practice dictates that the performance of a PV module is determined by exposing it at known standard rating conditions (SRCs) of irradiance, GUo = 1000 W/m2, and cell temperature, Tf = 25°C. These conditions are different from the nominal operating cell temperature (NOCT), as indicated in Table 9.1. 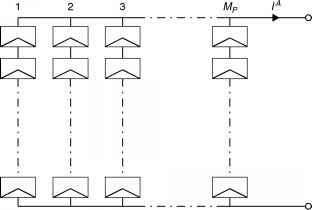 FiGURE 9.12 Cell array consisting of MP parallel branches, each with MS modules in series. A PV system is required to produce 250 W at 24 V. Using the solar cells of Example 9.2, design the PV panel, working at the maximum power point, if each cell is 9 cm2 in area. This yields a power per cell = 0.47 X 0.2133 = 0.1 W. Number of cells required = 250/0.1 = 2500. Number of cells in series = System voltage/Voltage per cell = 24/0.47 = 51.1—52 (in fact with 52 cells, Voltage = 24.44 V). Number of rows of 52 cells each, connected in parallel = 2500/52 = 48.1—48 (in fact this panel yields 48 X 52 X 0.1 = 249.6 W). PV cells are fragile and susceptible to corrosion by humidity or fingerprints and can have delicate wire leads. Also, the operating voltage of a single PV cell is about 0.5 V, making it unusable for many applications. 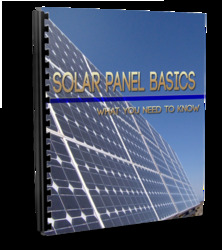 A module is a collection of PV cells that provides a usable operating voltage and offers means that protects the cells. Depending on the manufacturer and the type of PV material, modules have different appearances and performance characteristics. Also, modules may be designed for specific conditions, such as hot and humid, desert, or frozen climates. Usually, the cells are series connected to other cells to produce an operating voltage around 14-16 V. These strings of cells are then encapsulated with a polymer, a front glass cover, and a back material. Also, a junction box is attached at the back of the module for convenient wiring to other modules or other electrical equipment. Many types of PV cells are available today. This section gives details on the current types and an overview of the cells that are currently in the research and development stage. • Monocrystalline silicon cells. These cells are made from pure monocrys-talline silicon. In these cells, the silicon has a single continuous crystal lattice structure with almost no defects or impurities. The main advantage of monocrystalline cells is their high efficiency, which is typically around 15%. The disadvantage of these cells is that a complicated manufacturing process is required to produce monocrystalline silicon, which results in slightly higher costs than those of other technologies. • Multicrystalline silicon cells. Multicrystalline cells are produced using numerous grains of monocrystalline silicon. In the manufacturing process, molten polycrystalline silicon is cast into ingots, which are subsequently cut into very thin wafers and assembled into complete cells. Multicrystalline cells are cheaper to produce than monocrystalline ones because of the simpler manufacturing process required. They are, however, slightly less efficient, with average efficiencies being around 12%. • Amorphous silicon. The general characteristics of amorphous silicon solar cells are given in Chapter 1, Section 1.5.1. Generally, the main difference between these cells and the previous ones is that, instead of the crystalline structure, amorphous silicon cells are composed of silicon atoms in a thin homogenous layer. Additionally, amorphous silicon absorbs light more effectively than crystalline silicon, which leads to thinner cells, also known as a thin film PV technology. The greatest advantage of these cells is that amorphous silicon can be deposited on a wide range of substrates, both rigid and flexible. Their disadvantage is the low efficiency, which is on the order of 6%. Nowadays, the panels made from amorphous silicon solar cells come in a variety of shapes, such as roof tiles, which can replace norma! brick tiles in a solar roof. • Thermophotovoltaics. These are photovoltaic devices that, instead of sunlight, use the infrared region of radiation, i.e., thermal radiation. A complete thermophotovoltaic (TPV) system includes a fuel, a burner, a radiator, a longwave photon recovery mechanism, a PV cell, and a waste heat recuperation system (Kazmerski, 1997). TPV devices convert radiation using exactly the same principles as photovoltaic devices, outlined in previous sections. The key differences between PV and TPV conversion are the temperatures of the radiators and the system geometries. In a solar cell, the radiation is received from the sun, which is at a temperature of about 6000 K and a distance of about 150 X 106 km. A TPV device, however, receives radiation, in either the broad or narrow band, from a surface at a much lower temperature of about 1300-1800 K and a distance of only a few centimeters. 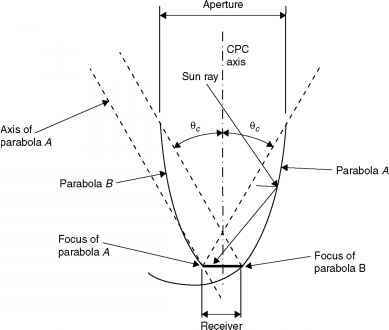 Although the blackbody power radiated by a surface varies at the fourth power of the absolute temperature, the inverse square law dependence of the power received by the detectors dominates. Therefore, although the power received by a non-concentrator solar cell is on the order of 0.1 W/cm2, that received by a TPV converter is likely to be 5-30 W/cm2, depending on the radiator temperature. Consequently, the power density output from a TPV converter is expected to be significantly greater than that from a non-concentrator PV converter. More details on TPVs can be found in the article by Coutts (1999). In addition to the above types, a number of other promising materials, such as cadmium telluride (CdTe) and copper indium diselenide (CuInSe2), are used today for PV cells. The main trends today concern the use of polymer and organic solar cells. The attraction of these technologies is that they potentially offer fast production at low cost in comparison to crystalline silicon technologies, yet they typically have lower efficiencies (around 4%), and despite the demonstration of operational lifetimes and dark stabilities under inert conditions for thousands of hours, they suffer from stability and degradation problems. Organic materials are attractive, primarily due to the prospect of high-output manufacture using reel-to-reel or spray deposition. Other attractive features are the possibilities for ultra-thin, flexible devices, which may be integrated into appliances or building materials, and tuning of color through the chemical structure (Nelson, 2002). Another type of device investigated is the nano-PV, considered the third-generation PV; the first generation is the crystalline silicon cells, and the second generation is amorphous silicon thin-film coatings. Instead of the conductive materials and a glass substrate, the nano-PV technologies rely on coating or mixing "printable" and flexible polymer substrates with electrically conductive nanoma-terials. This type of photovoltaics is expected to be commercially available within the next few years, reducing tremendously the traditionally high costs of PV cells. Photovoltaic modules can be mounted on the ground or a building roof or can be included as part of the building structure, usually the façade. Wind and snow loading are major design considerations. The PV modules can last more than 25 years, in which case the support structures and building should be designed for at least as long as the same lifetime. Related equipment includes batteries, charge controllers, inverters, and peak-power trackers. Batteries are required in many PV systems to supply power at night or when the PV system cannot meet the demand. The selection of battery type and size depends mainly on the load and availability requirements. When batteries are used, they must be located in an area without extreme temperatures, and the space where the batteries are located must be adequately ventilated. The main types of batteries available today include lead-acid, nickel cadmium, nickel hydride, and lithium. Deep-cycle lead-acid batteries are the most commonly used. These can be flooded or valve-regulated batteries and are commercially available in a variety of sizes. Flooded (or wet) batteries require greater maintenance but, with proper care, can last longer, whereas valve-regulated batteries require less maintenance. The principal requirement of batteries for a PV system is that they must be able to accept repeated deep charging and discharging without damage. Although PV batteries have an appearance similar to car batteries, the latter are not designed for repeated deep discharges and should not be used. For more capacity, batteries can be arranged in parallel. Batteries are used mainly in stand-alone PV systems to store the electrical energy produced during the hours when the PV system covers the load completely and there is excess or when there is sunshine but no load is required. During the night or during periods of low solar irradiation, the battery can supply the energy to the load. Additionally, batteries are required in such a system because of the fluctuating nature of the PV system output. As can be understood from the preceding definition and Eq. (9.22), SOC can take values between 0 and 1. If SOC = 1, then the battery is fully charged; and if SOC = 0, then the battery is totally discharged.